Eleonore Caroit joined LALIVE in 2015. Her main area of practice is international arbitration, including commercial and investment treaty arbitration. She has acted as arbitrator, counsel and as administrative secretary to arbitral tribunals in a number of international arbitral proceedings, both ad hoc and administered (ICC, Swiss rules, UNCITRAL, ICSID, SCC and CAM) governed by various procedural and substantive laws. Her experience covers a range of international contracts including sales, distribution and shareholder agreements notably in the banking, energy, telecommunications, construction and infrastructure sectors. She also has experience in cross-border litigation and corporate matters. Eleonore Caroit is a member of the ICC Commission on Arbitration and ADR since 1 January 2017. She is part of the working group on arbitration of the French Conseil national des barreaux and is also a member of the arbitration consultative committee of Delos in Paris. In 2018, she was appointed to the board of Comité Français de l’Arbitrage-40 for a three-year term. Eleonore Caroit is member of several professional associations including Arbitral Women (where she is part of the gender equality committee), the International Bar Association (IBA), the Club Español del Arbitraje, ASA below 40, Young Arbitrators Forum of the ICC (YAF), Young ICCA, and the LCIA’s Young International Arbitration Group (YIAG). She is also a member of the Section des Avocats de Barreaux Etrangers (SABE) of the Geneva Bar. Eleonore Caroit regularly speaks at conferences and publishes in international arbitration. She was a guest lecturer in international arbitration in the LL.M. in International Trade Law course at the University of Turin. Before joining LALIVE, Eleonore Caroit practiced international arbitration at an international law firm in Paris (2012-2015) and corporate law at another international law firm (2010-2012). Eleonore Caroit graduated from the Institut d’Etudes Politiques de Paris (Sciences-Po). She holds a joint Masters degree in Global Business Law from the Université de Paris I, Panthéon-Sorbonne and Sciences-Po Paris. She also holds an LL.M. from Columbia Law School where she was a Harlan Fiske Stone scholar and received the Parker School recognition in international and comparative law. 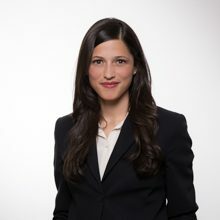 Eléonore Caroit draws high praise for her “truly international arbitration practice”, which encompasses both commercial and investment treaty disputes. XI Encuentro del CEA-40: "Visiones internacionales del arbitraje, ¿hacia dónde vamos los jóvenes?" Santo Domingo 25/05/2017 Eleonore Caroit Speaker: ¿Cuándo es necesaria la asistencia del tribunal judicial en el diligenciamiento de pruebas en el arbitraje internacional? 1er Etats Généraux de l’Arbitrage : Faites de l’arbitrage ! Santo Domingo 24/11/2015 Eleonore Caroit Speaker: La audiencia arbitral & Causales de anulación -¿Qué significan?, ¿Qué no? Is arbitration heading toward a model procedure (and is that a good thing)?